What do teacher unions do, anyway? Teachers’ unions have tremendous influence in America’s public schools, perhaps nowhere more so than in California. What do teachers' unions do? Do all school districts use collective bargaining? How do teacher contract negotiations work? How much do teachers pay in union dues, and where does the money go? Are teacher union dues mandatory? What are paycheck protection laws? How does California's biggest teachers union make decisions? This lesson describes the major functions of these unions, and summarizes varying points of view about their role in student learning. There are two main national teachers unions in the USA: the National Education Association (NEA) and the American Federation of Teachers (AFT). Most California K-12 teachers are organized by the California Teachers Association (CTA), which is NEA-affiliated. California’s largest districts are dual-affiliated with both CTA and CFT, the state branch of the AFT. This may seem like detail, but it is an important one: there is more than one teacher union. Although teacher unions work hard to align their point of view (which maximizes their power) they are, in fact, complicated organizations containing many divergent interests. Teacher contracts in California districts are negotiated between the school board (represented at the bargaining table by local district leaders) and the teachers (represented by local union leaders). The negotiation process, called collective bargaining, has been in place since the passage of the Rodda Act in 1975. In California, virtually every school district uses collective bargaining. School district finances and contracts are complex. Both local unions and school districts rely on state organizations for technical support. The state organizations of the CTA and CFT provide negotiating support to their local affiliates, while school districts seek advice from consultancies such as School Services of California. If you want to see what the contracts actually look like, check the National Council on Teacher Quality. It has posted copies of collective bargaining agreements for America’s 100 largest districts, and provides an orderly database to research the major provisions of these agreements. Negotiating support is one of many services that the state teacher unions provide their affiliates. Another notable service is the state union's role in state education policy. Both CTA and CFT are members of California's "Education Coalition," a group of education-related advocacy organizations. This coalition lobbies for education spending in the annual zero-sum budget battle with other budget priorities from prisons to health care to transportation. This is important work, particularly in California, which spends proportionally less of its tax dollars on education than most states do. There is great sound and fury in education reform discussions about whether unions are “good” or “bad” for public education. Most old hands in the education arena (though not all) view this as a false dichotomy. Teacher pay is higher in states with strong unions. There is no question that states with strong unions, such as California, pay teachers more than those with weaker unions. Teachers in strong-union states also generally have more generous health care benefits. For the big picture of how teacher pay in California has compared to other states over time, see the graph in Lesson 3.1. Supporters of teachers unions also argue that these unions head off a great deal of potential mischief from state micromanagement of what happens in the classroom. CTA lobbyists generally oppose bills that create hard and fast rules about what teachers can or cannot do, favoring policies that place authority at the local level where districts and unions can work them out through collective bargaining. Among influential thinkers who support teacher unions, perhaps the most prolific and well-known is Diane Ravitch. Among critics of unionism in education, one vocal figure is Terry Moe, who argues that unions’ interests are poorly aligned with those of students and taxpayers. In California, the most potent voice is probably that of Mike Antonucci. At the state level, critics object to teacher unions’ capacity to raise funds for political action. A typical full-time teacher in a CTA-affiliated district pays over $1,000 in union dues annually. Of this amount, about 15% goes to the NEA, about 20% goes to the local affiliate, and the remainder goes to the CTA state organization. A portion of these resources supports the unions’ political efforts. School districts are not allowed to spend public money on political campaigns. After decades of fierce debate, in 2018 the US Supreme Court ruled in the Janus decision that union fees are a form of speech protected by the First Amendment, and that mandatory "fair share" fees for representation in collective bargaining are an unconstitutional form of "coerced speech". This was major reversal with big implications for the education system. In 1977 the US Supreme Court had ruled unanimously in the case Abood v. Detroit Board of Education that it was permissible for unions to collect mandatory fees from employees, even those that opted out of membership in the union. In the years that followed, about half of American states, including California, passed laws that permitted school districts and other employers to negotiate "agency shop" agreements that required all employees to pay such fees, known as "agency fees" or "fair share" fees. Not all states supported the "agency shop" approach allowed by Abood. Some states passed "paycheck protection" measures, requiring that unions gather an "opt in" commitment from each member in order to collect certain dues or fees from them. In 2015 the US Supreme Court took up review of the matter in the Friedrichs case, but split 4-4 with one open seat. The 2018 Janus decision reversed Abood in a bitterly divided 5-4 ruling. In effect, the Janus decision means that teachers cannot be required to pay fees related to their representation. In their deliberations, Justices on the Supreme Court mentioned concerns about "labor peace". If dues are not collected from all teachers, some labor historians argue ominously, a functioning system will be disrupted with unknown consequences. For example, labor advocates express concerns that public labor union leaders might find themselves under pressure to become more militant to unify their membership in negotiations. Union opponents counter that the evidence of militancy is thin in states with "right to work" laws. Teacher strikes are legal in California but thankfully they have been quite rare. But in the wake of the Janus ruling the word "strike" was uttered frequently in Los Angeles in 2018-19. The threat of strikes and other actions seems certain to change the relationship between districts and unions. Parent groups might want to view the Janus ruling as a reminder not to take the relationship between the school district and the teachers union for granted. 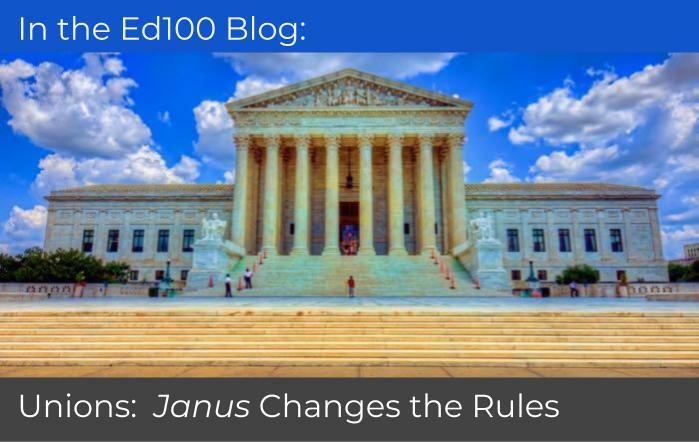 For more about Janus, and why it matters to parent leaders, see New Rules for Teachers Unions in the Ed100 blog. The unions aren’t going anywhere, and even after Janus they have tremendous power. Anyway, there isn’t persuasive evidence that absence of a union is any more of a magic answer than any other one-shot education reform wish. The leadership of teacher's unions is usually stable over time. School board members have limited terms. Administrators may change districts. Teachers, by contrast, work in a system that discourages moving. It is worth noting that the leadership of teachers unions is usually stable over time. School board members have limited terms. Administrators may change districts. Teachers, by contrast, work in a system that directly discourages moving. They are rewarded with seniority and higher salaries when they stay with a district. The individuals involved in union leadership generally stay involved for many years. The long experience and steady perspective of union leadership creates an opportunity for teacher unions to play a strong role in education change, if a consensus for change can emerge. The Teacher Union Reform Network (TURN) is an informal national organization of union leaders that meets regularly to discuss ideas for change. Nimbleness is out of the question. There are only a few conference halls in California large enough to host a CTA state council meeting. Like Congress (for perspective, a policymaking body about half its size), the State Council uses a highly structured deliberative process that includes standing committees, speechmaking, and internal politics. Decisions are brought to the full 800 delegates for a vote. CTA staff and executive leadership are guided in their actions by a massive policy manual that the organization takes quite seriously. Changes to CTA policy must go through the State Council, a process that takes time. Many points of view exist within the organization, but it can take quite a while for ideas to bubble to the surface in the form of policy changes. Changes can happen, but nimbleness is virtually out of the question. Annual dues are the major source of resources for California’s teacher unions. About how much per year does each teacher pay in dues? I see no mention here of the input of classified employees also unionized who play a significant role in the big picture for each school district. I appreciate that they are not in the teacher-management negotiations literally, but I bet they are there as a factor in what happens. I know they are in on the calendar negotiations and other matters, for example affecting school meals, when provided, what is provided etc which ties into how student fare in the classroom. A very complex picture indeed. I am a firm believer in unions, with the admission that no union acts perfectly all of the time. Collective bargaining and representation of group interests with management is beneficial to teachers (I say teachers since that is the group we are most concerned with here). I find it astonishing that teachers can opt not to pay for their 'share' of collective bargaining but get the benefits. I appreciate no one wants or can negotiate separately with each non-union teacher (! ), but getting a free ride is akin to the anti-vaxxers who don't vaccinate but think they'll benefit from the herd being vaccinated. The CTA has just launched a new teacher training program. This is a joint effort with the Stanford Center for Opportunity Policy in Education (SCOPE) and the National Board Resource Center at Stanford University. The project is funded by the S.D. Bechtel, Jr. Foundation, Stuart Foundation, the National Education Association and the California Education Policy Fund.